The Star Wars saga has always centered on the timeless struggle between good and evil. At different points throughout the saga, evil may be lurking in the shadows or controlling an oppressive, galaxy-spanning Empire. Yet, there must always be balance in the Force, and whenever the dark side rises, a spirit of rebellion begins to light the way forward. 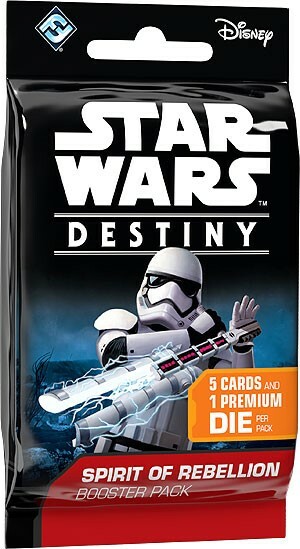 With Spirit of Rebellion Booster Packs for Star Wars: Destiny, 160 brand-new cards enter the game, incorporating elements from every movie in the saga, but with a special focus on the newest Star Wars movie: Rogue One. You`ll find plenty of characters from Rogue One within this set, including Jyn Erso, Chirrut Imwe, Mon Mothma, and Director Krennic, alongside other iconic characters from across the Star Wars story. Offered in 36-count displays, each booster pack contains five randomized cards and one premium die.